A flashlight in the hand is worth more than five flashlights that you can’t get to when you need one. How often have you found yourself in a situation where a flashlight would be helpful – only to have that great flashlight you bought be somewhere else entirely? The truth is that the best flashlight in the world won’t do you a lot of good if it’s sitting in your utility drawer at home and you’re out on the side of the road. 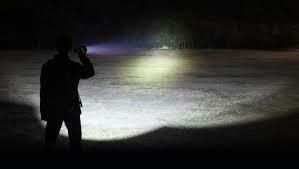 In fact, it’s probably best to have several good, functioning flashlights like the My Pocket Lite Beam handheld LED flashlight on hand and stashed in the places you’re most likely to need them. These are five spots where a portable torch or handheld flashlight comes in very handy. If you’ve got a job that often involves using a flashlight, there’s nowhere handier for your torch than hanging from your belt. My Pocket Lite Beam is lightweight enough that it won’t drag your pants down, and the built in belt clip makes it easy to keep it right where you can reach it at all times. You might also want to slide the torch onto your belt if you’re going on a hike or a nighttime bike ride. Hang a flashlight on a hook by the back door and you’ll never have to hunt one down when you’re taking the trash out late at night. Whether you’re heading out into the backyard or have to walk down one or two flights of stairs with the hallway light out, you’ll be glad you’ve got a pocket lite beam right where you need it. You never know when you might need a little extra illumination at work. People tend to think of flashlights for emergency situations – blackouts, power failures and the like – but flashlights are also useful when you have to find something under a desk or behind the printer stand, or when you’re trying to see inside the printer or copy machine. And of course, if something does go very wrong and you have to make your way down a dark staircase with no power, that flashlight in your desk drawer will be more than just a convenience – it could be a lifesaver. There are easily dozens of reasons you might need a bright, LED flashlight when you’re out on the road. The Pocket Lite Beam is the ideal flashlight to keep in the glove box. It’s small enough to fit, but not so small you’ll lose it. The LED bulb throws bright light – and the switch allows you to focus it from wide – and bright enough to illuminate an entire campsite – to a narrow pinpoint that penetrates darkness for thousands of feet. It even has a strobe function so you can use it as an emergency signal. Well, why not? It’s the traditional place to keep a portable flashlight for some very good reasons. The Pocket Lite Beam is an especially good choice as your household flashlight. Its efficient battery use means it will nearly always turn on when you need it, and the small, lightweight size makes it practical for even your younger children to use.